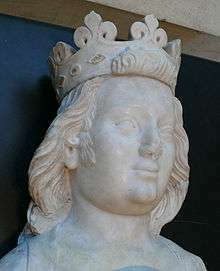 Charles IV (Clermont 18/19 June 1294 – Vincennes 1 February 1328), called the Fair (le Bel) in France and the Bald (el Calvo) in Navarre, was the last direct Capetian King of France and King of Navarre (as Charles I) from 1322 to his death. Charles was the third son of Philip IV; like his father, he was known as "the fair" or "the handsome". Charles inherited a long-running period of tension between England and France. Edward II of England, as Duke of Aquitaine, owed homage to the King of France, but he had successfully avoided paying homage under Charles' older brother Louis X, and had only paid homage to Philip V under great pressure. Once Charles took up the throne, Edward attempted to avoid payment again. One of the elements in the disputes was the border province of Agenais, part of Gascony and in turn part of Aquitaine. Tensions rose in November 1323 after the construction of a bastide, a type of fortified town, in Saint-Sardos, part of the Agenais, by a French vassal. Gascon forces destroyed the bastide, and in turn Charles attacked the English-held Montpezat: the assault was unsuccessful, but in the subsequent War of Saint-Sardos Charles' trusted uncle and advisor, Charles of Valois, successfully wrested control of Aquitaine from the English; by 1324, Charles had declared Edward's lands forfeit and had occupied the whole of Aquitaine apart from the coastal areas. Charles's sister Isabella was married to King Edward II of England and was sent to France in 1325 with the official mission of negotiating peace with her brother; unofficially, some chroniclers suggested that she was also evading Hugh Despenser the elder and Hugh the younger, her political enemies in England. Charles had sent a message through Pope John XXII to Edward suggesting that he was willing to reverse the forfeiture of the lands if Edward ceded the Agenais and paid homage for the rest of the lands. The Pope in turn had proposed Isabella as an ambassador. Charles met with Isabella and was said to have welcomed her to France. Isabella was joined by the young Prince Edward later that year, who paid homage to Charles on his father's behalf as a peace gesture. Despite this, Charles refused to return the lands in Aquitaine to the English king, resulting in a provisional agreement under which Edward resumed administration of the remaining English territories in early 1326, whilst France continued to occupy the rest. In 1307, Charles married Blanche of Burgundy, daughter of Otto IV, Count of Burgundy. The marriage was dissolved in 1322. They had two children: Philip (January 1314 – March 1322) and Joan (1315 – 17 May 1321). In 1322 he married Marie of Luxembourg, daughter of Henry VII, Holy Roman Emperor. They had a son named Louis (March 1324). 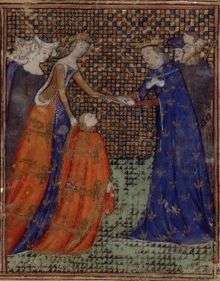 On 5 July 1324 he married Jeanne d'Évreux (1310–71). Their children were Jeanne (May 1326 – January 1327), Marie (1327 – 6 October 1341) and Blanche (1 April 1328 – 8 February 1382). Charles is a character in Les Rois maudits (The Accursed Kings), a series of French historical novels by Maurice Druon. He was portrayed by Gilles Béhat in the 1972 French miniseries adaptation of the series, and by Aymeric Demarigny in the 2005 adaptation. 1 2 3 4 5 6 7 8 9 Kibler, p.201. 1 2 "Charles IV (of France)". Encarta. Microsoft Corporation. 2008. 1 2 3 Sumption, p.97. 1 2 Echols and Williams, p.87. ↑ Echols and Williams, p.328. 1 2 3 Lord, p.48. ↑ Kibler, p.201; Nirenberg, p.67. 1 2 3 4 Holmes, p.16. ↑ Holmes, p.16; Kibler, p.201. ↑ Kibler, p.314; Sumption, p.98. ↑ Vauchez, Dobson and Lapidge, p.288.